Event attendees discussing their concerns and hopes for rural Minnesota and the values underlying life here. 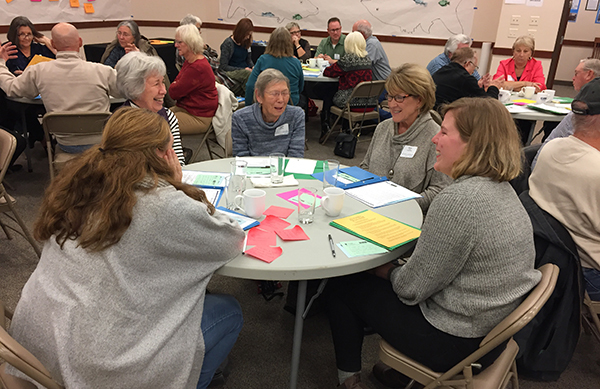 A shared vision about the future of Minnesota brought together over one hundred people in Maynard, MN on Thursday, November 9 in an event co-hosted by CURE and the Land Stewardship Project (LSP). In the current political climate average Minnesotans, especially in rural areas, might feel that their voices are not being heard and that their needs are not being addressed on the political landscape. The goal of the CURE and LSP collaboration, which is part of a larger “Our Minnesota Future” effort happening around the state, is for people to tell their own stories based on shared values to build the power to govern, and champion a ‘people’s agenda’ for Minnesota. 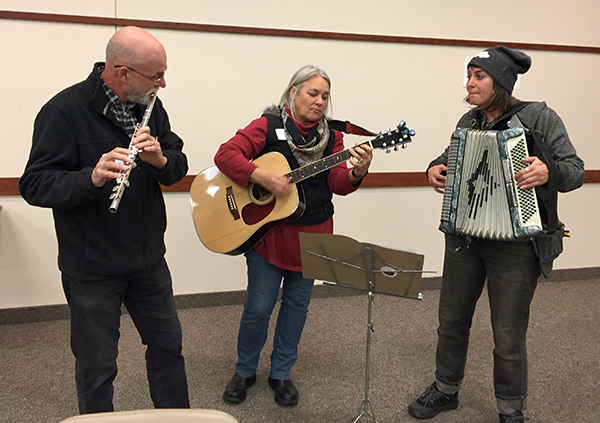 Music and stories kicked off the event and harkened back to earlier rural organizing movements. In small groups discussions, attendees talked about issues they feel need to be addressed in their communities along with their hopes. Most importantly though, folks talked about the values that underscore these issues and hopes. There was also lively debate as the whole group discussed community values upholding a shared vision for Minnesota. The current ‘rural reality’ narrative can sound depressing. It was a shared sentiment at the meeting that it should not be a sacrifice to live here. However, the overall tone of the gathering was hopeful, and a primary value that arose from the discussion was that “We all need each other.” The new story coming from rural Minnesotans is one of empowerment and hope, and it’s a vision for all Minnesotans. A visualization of the values expressed by the event attendees. Did you miss the meeting in Maynard, but you still want to raise your voice and share your story? You can! Join CURE at the Our Minnesota Future People’s Assembly on Sunday, December 3rd. Register HERE. I am fascinated, intrigued, enthused, about the notion to enhance the sense of living in a democracy (within a democratic system of governance) here in rural Minnesota. How do we do that? “Telling our stories,” “building our power to govern,” and “championing a people’s agenda” are wonderful goals. Bur I don’t see a vision yet articulated. I haven’t yet seen a ‘road map” of how collectively achieve that. What are the steps we need to take to replace a corporate-needs dominated government with one that responds to the needs of the broader community, including the rural business community? What is our collective story for our future? What is our vision? Most importantly, how do we segue our thoughts and actions outside of our “digital silo” into the people-to-people realities of city, township, county and state politics?